3 Marlborough is located on the north side of Marlborough, between Arlington and Berkeley, with 1 Marlborough to the east and 5 Marlborough to the west. 3 Marlborough was designed by architect Charles K. Kirby and built by William W. Bray, mason, in 1862-1863, one of three contiguous houses (3-5-7 Marlborough) that form a symmetrical composition with a single entrance porch. In his Houses of Boston’s Back Bay, Bainbridge Bunting does not attribute 3-5-7 Marlborough to a specific architect. However, deeds for the houses confirm that they were designed by Charles K. Kirby. The land on which 3-5-7 Marlborough were built was part of a larger parcel purchased by Peleg W. Chandler, J. Amory Davis, and Henry Lee, Jr., on September 2, 1858, from George Goss and Norman Carmine Munson. 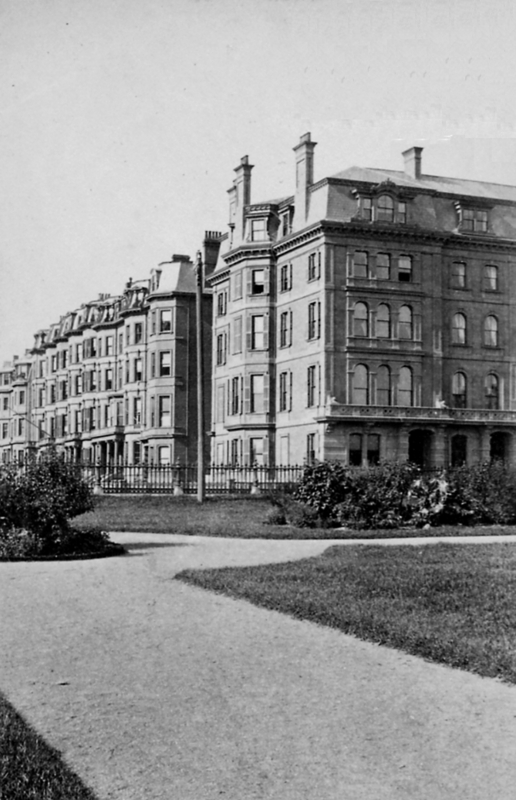 George Goss and Norman Munson had purchased the land from the Commonwealth of Massachusetts that same day; they were the contractors responsible for filling the Commonwealth’s Back Bay lands. In 1862, Charles Kirby entered into an agreement with Messrs. Chandler, Davis, and Lee to purchase the land for 3-5-7 Marlborough and build the houses on it. The agreement does not appear to have been recorded with the Suffolk County deeds, but is referenced in a party wall agreement dated June 21, 1862, with George T. Shattuck, owner of the land at 9 Marlborough. On June 27, 1862, Charles Kirby entered into an agreement with William W. Bray to provide the materials and labor to build the three houses. On March 9, 1863, as the houses were nearing completion, Charles Kirby purchased the land from Messrs. Chandler, Davis, and Lee. On the same day, he sold 3 Marlborough to George Otis Shattuck. He also sold 5 Marlborough on the same day, and sold 7 Marlborough in May of 1863. Each of the deeds included a provision preventing material changes to the front façades without the consent of the owners of all three properties. Click here for an index to the deeds for 3 Marlborough. George Otis Shattuck and his wife, Emily (Copeland) Shattuck, made 3 Marlborough their home. They previously had lived at 71 Revere Street. He was an attorney. They continued to live at 3 Marlborough during the 1881-1882 winter season, but moved thereafter to 166 Beacon. On August 16, 1882, George Shattuck transferred 3 Marlborough to his daughter, Susan, who married on that day to Dr. Arthur Tracy Cabot. 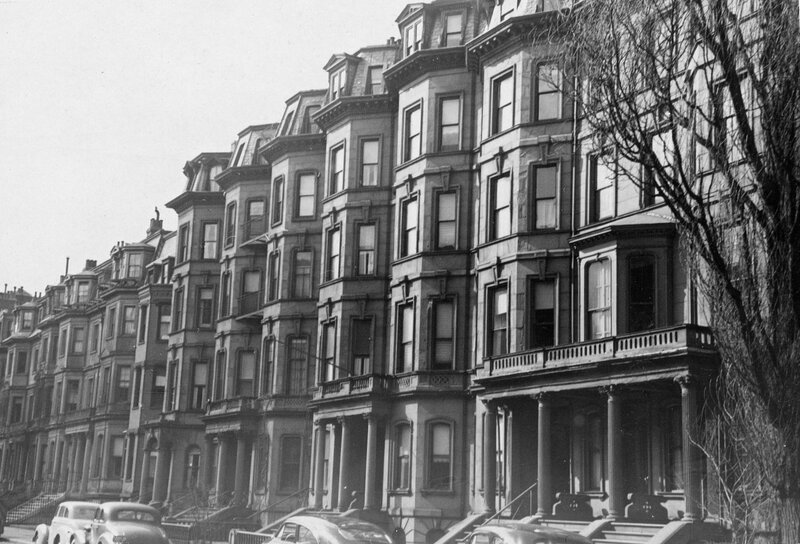 The Cabots made it their Boston home; they also maintained a home in Canton. Arthur Cabot was a surgeon specializing in genito-urology. In March of 1893, he purchased 1 Marlborough, next door, to serve as his medical office. His first cousin, Dr. Hugh Cabot, joined his practice in about 1900, and they continued to maintain their practice there until Arthur Cabot’s death in November of 1912. Arthur Cabot’s father, Samuel Cabot, was the brother of Hugh Cabot’s father, James Elliot Cabot. Arthur and Susan Cabot continued to live at 3 Marlborough during the 1911-1912 winter season, but moved thereafter to 36 Commonwealth. On October 2, 1912, 3 Marlborough was acquired from Arthur Cabot by his first cousin, Philip Cabot, the twin brother of Dr. Hugh Cabot. He previously had lived at 1 Mt. Vernon Square. Philip Cabot was a real estate trustee and investor. He and his wife, Lucy (Fuller) Cabot, had divorced in 1911 and his two daughters, Sylvia and Faith, lived with him. 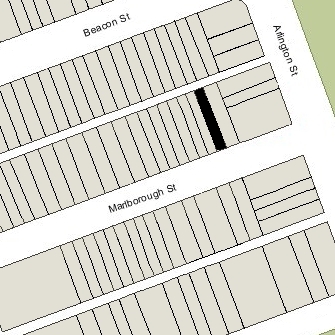 They continued to live at 3 Marlborough in 1919, but moved to Milton by 1920. In January of 1920, at the time of the 1920 US Census, 3 Marlborough was the home of Richard Hathaway Morgan and his wife, Joanna White (Davis) Morgan. Richard Morgan was a retired manufacturer from New Bedford; he and his wife also maintained a residence in Plymouth. Living with the Morgans at 3 Marlborough was Joanna Morgan’s brother, Charles Stevenson Davis, a lawyer. On June 1, 1920, 3 Marlborough was purchased from Philip Cabot by Mary Arnold (Whitman) Bullard, the former wife of Gardner Cutting Bullard. She lived in Brookline with her parents, William Whitman and Jane Dole (Hallet) Whitman. In July of 1920, Mary Bullard’s father, William Whitman, applied for (and subsequently received) permission to replace the existing wooden laundry and sheds at the rear of 3 Marlborough with a brick ell. The remodeling was designed by architect Charles Greely Loring. Charles Loring’s sister, Ruth, was the wife of Mary Bullard’s brother, William Whitman, Jr. William and Ruth Whitman lived at 17 Commonwealth. By the 1920-1921 winter season, 3 Marlborough was the home of Mary Bullard’s son-in-law and daughter, Walter Irving Badger, Jr., and Jane (Bullard) Whitman Badger. They previously had lived at 140 Mt. Vernon. They also maintained a home at West Chop on Martha’s Vineyard. He was an attorney. Mary Bullard died in May of 1922. 3 Marlborough remained the property of her estate and the Badgers continued to live there until about 1940, when they moved to an apartment at 172 Beacon. On November 18, 1940, 3 Marlborough was purchased from Mary Bullard’s estate by Gurdon Saltonstall Worcester and his wife, Natalie B. (Shipman) Worcester. They previously had lived in an apartment at 9 Commonwealth. A former newspaper publisher, Gurdon Worcester was a consulting psychologist. He also was an author and songwriter. They continued to live at 3 Marlborough until 1960. On June 29, 1960, 3 Marlborough was acquired from the Worcesters by Archibald Stark and his wife, Eleanor (McCandless) Stark. He was a guidance counselor at Newton High School. 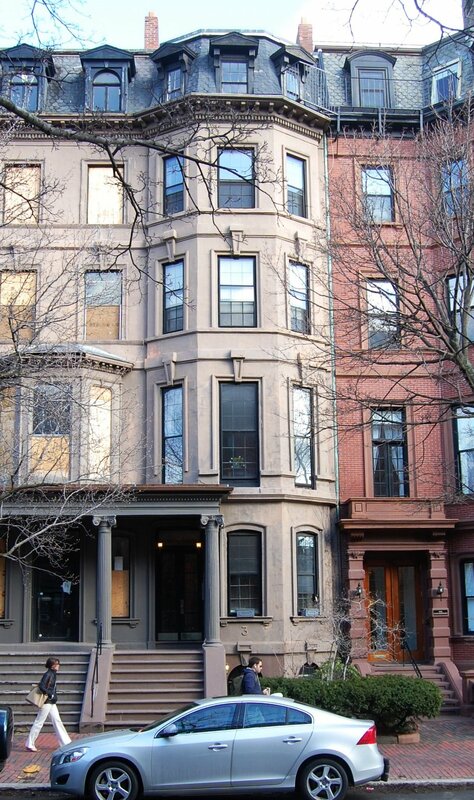 They continued to live at 3 Marlborough in 1962, but had moved th an apartment at 334 Commonwealth by 1963. On October 1, 1962, 3 Commonwealth was acquired from the Starks by John Breining and his wife, Ruth Y. (Allen) Breining. They previously had lived at 304 Beacon, where they operated Miss Allen’s Back Bay School of Modeling. By 1963, the school had closed and in the City Directory, John Breining indicated his employment as being a construction worker. By the mid-1960s, 3 Marlborough had been converted into apartments, although no record of the change in occupancy appears to have been filed with the Building Department. John Breining’s mother, Emma (Olson) Breining, the widow of Eric Breining, was living at 3 Marlborough the time of her death in May of 1965. John Breining died in May of 1968 and Ruth Breining moved soon thereafter. She continued to own 3 Marlborough and in March of 1974, the Building Department cited her for failing to provide a second means of egress for apartment 4, in the front, and for failing to provide a fire-rated partition to separate apartment 6 from the public hallway. On June 26, 1979, Ruth Breining sold 3 Marlborough to her son-in-law and daughter, Christopher Peters, II, and Kimberly Breining-Peters. They began remodeling the building, filing with the Building Department to indicate that they were “cleaning out the building and removing non-bearing partitions” and would file a subsequent permit application indicating their proposed future use. 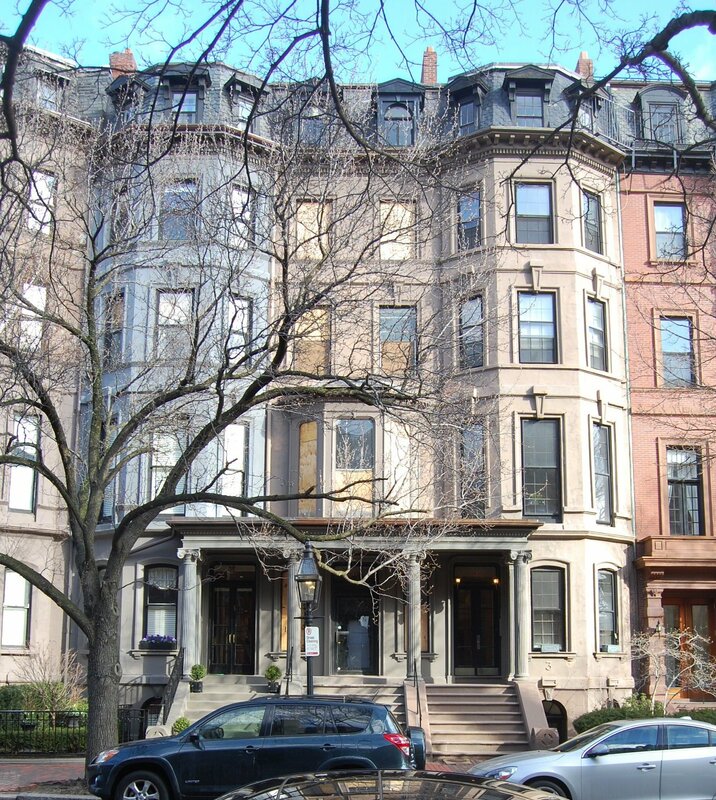 On March 24, 1980, 3 Marlborough was purchased from Christopher and Kimberly Peters by 3 Marlborough Street Associates, Inc. (Robert Epstein, president). In April of 1980, it filed for (and subsequently received) permission to remodel the house into four apartments, including adding a penthouse story. 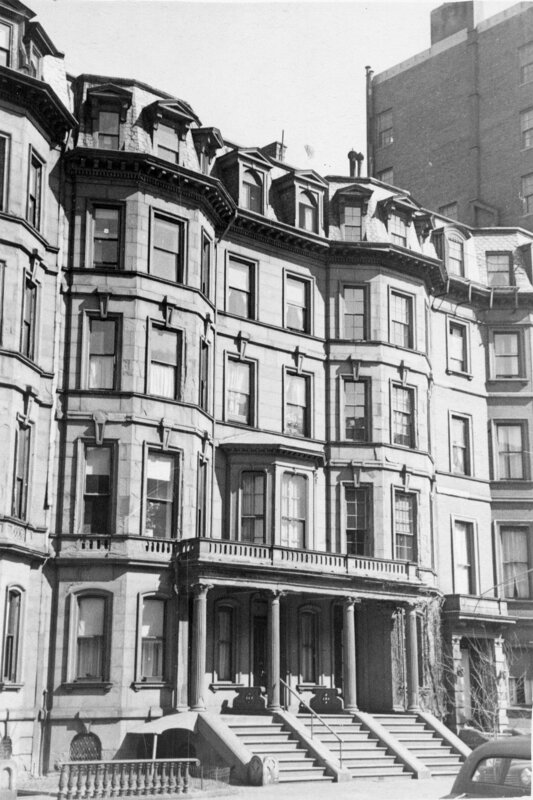 On March 9, 1981, 3 Marlborough Street Associates converted the house into four condominium units, the 3 Marlborough Street Condominium. 1-7 Marlborough, with 7 Arlington in foreground (ca. 1870), courtesy of the Bostonian Society.